Health and Safety Sciences offers contract safety response teams for industrial/oil & gas, government and federal safety response teams. Health and Safety Sciences’ HazMAT24 training teams are high-speed real world responders that have hundreds of responses under their belts. We offer two qualifying Confined Space Rescue Technician courses utilizing our mobile confined space rescue simulator. Health and Safety Sciences Emergency Response Team trainings stand apart in their thoroughness and results. Mastery level learning is the goal, ensuring your team can perform under pressure. We have experience in all facets of safety response: incident management to post incident investigations; water borne operations to high angle operations and much more. We are pleased to offer several first aid and emergency medical response courses accredited by the American Safety and Health Institute. Obtain credentials as a Special Operations Rescue Technician (S.O.R.T) or Rescue 3 International certifications in Technical Rope Rescue, Water and Flood Rescue. Health and Safety Sciences offers health and safety training courses and credentialing programs for industrial/oil & gas, government and federal safety response teams. The HSS’ Instructor cadre consists of current/former fire service, emergency management, law enforcement and military personnel. All of HSS team members have real world, high speed experience, which they bring to your organization’s front door. If your organization is only interested in checking the safety training block – do not call HSS. Earning a skill set from HSS’ instructor cadre is a mark of excellence and has to be earned. Students are immersed in lecture and practical exercises that stretch them to their limits. Once the student successfully completes one of HSS’ trademark courses, your organization can count on them when the chips are down. HSS’ instructors use time proven instructional techniques to move critical skill sets from short term memory into long term memory through a process called data chunking. Mastery level learning is the goal of each of the course offerings – as it should be. By having the students hear, see and then do, HSS instructors ensure your team members can perform under pressure effectively, precisely and consistently. The following gives a brief overview of the services offered by HSS. If you do not see a safety related service, contact HSS. We have experience in all facets of safety training and response – from incident management to post incident investigations; from water borne operations to high angle operations and all that falls in between. Sign up today for our most popular training classes. The OSHA Outreach Training Program provides training for workers and employers on the recognition, avoidance, abatement, and prevention of safety and health hazards in workplaces. The program also provides information regarding workers’ rights, employer responsibilities, and how to file a complaint. This is a voluntary program and does not meet training requirements for any OSHA standards. Through this program, workers can attend 10-hour or 30-hour classes delivered by OSHA-authorized trainers. The 10-hour class is intended for entry level workers, while the 30-hour class is more appropriate for supervisors or workers with some safety responsibility. Through this training, OSHA helps to ensure that workers are more knowledgeable about workplace hazards and their rights, and contribute to our nation’s productivity. Now Offering OSHA Outreach Training Courses. The OSHA Outreach Training Program provides training for workers and employers on the recognition, avoidance, abatement, and prevention of safety and health hazards in workplaces. The employer shall provide training and education for all fire brigade members commensurate with those duties and functions that fire brigade members are expected to perform. Such training and education shall be provided to fire brigade members before they perform fire brigade emergency activities. Fire brigade leaders and training instructors shall be provided with training and education which is more comprehensive than that provided to the general membership of the fire brigade. Live fire training is brought to your facility reducing the expense of sending your employees out of town to gain the required training for interior structural fire attack. All live fire training is conducted in compliance with NFPA 1403 standard. Facilities are provided with appropriate documentation and JPR completion sheets necessary to show compliance with 1910.156(c). Student successful completion of this 40-hour course is awarded 4 continuing education units (CEU) by Eastern Kentucky University Center for Career and Workforce Development. Per student tuition is $995.00 with a minimum of 12 student slots being charged to an organization per course offering and a maximum of 15 students allowed per course offering. (*Student textbook: Industrial Fire Brigade: Principles and Practice, Revised First Edition. ISBN-13: 9781284061680; and, travel cost(s) of instructor(s), per diem, hotel and mileage are additional charges per course offering based upon the location of the facility and number of students enrolled). 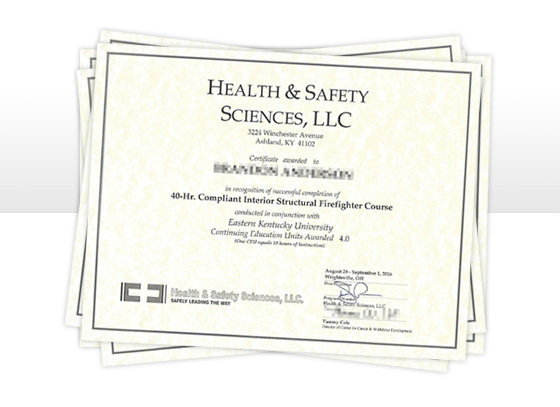 This course is solely intended for industrial fire brigades organized under the auspices of 1910.156(a) and is not intended for public firefighting organizations that are organized under the auspices of “government” and are managed by State/Commonwealth certifying bodies without the express written permission of the State/Commonwealth certifying body. Facilities are required to provide all necessary pumping apparatus, nozzle, hose equipment and student PPE for the student to safely perform interior structural firefighting in compliance with 1910.156(e)(1)(i). All students must have been medically cleared for interior firefighting duty and wearing of self-contained breathing apparatus prior to course attendance. Facilities must provide documentation to HSS prior to the start of each course attesting to compliance. The employer shall assure that training and education is conducted frequently enough to assure that each member of the fire brigade is able to perform the member’s assigned duties and functions satisfactorily and in a safe manner so as not to endanger fire brigade members or other employees. All fire brigade members shall be provided with training at least annually. In addition, fire brigade members who are expected to perform interior structural firefighting shall be provided with an education session or training at least quarterly. Pricing for quarterly training is issued based upon course content and course length selected by the facility. Call for pricing. Health and Safety Sciences, LLC offers a real-world based Incident Command COMMAND-Pro course utilizing our model industrial plant coupled with high-stress scenarios guaranteed to exercise student’s command and control ability. The model industrial plant is a scale model of a modern industrial facility with residential and commercial exposures at the property lines of the facility. Class size for the COMMAND-Pro program is capped at 15 students to ensure mastery level learning of the key incident command tenets. The COMMAND-Pro course is delivered over a 10 hour training day. HSS courses are high-speed and performance oriented. It is our goal to keep students in motion from the time they walk into the classroom until the whistle blows at the end of the training day. COMMAND-Pro course is instructed by the world renowned staff of HSS Talon Group Division. The instructional cadre of Talon Group is unprecedented in their combined incident command experience with instructors coming from Fire, Rescue, EMS, Law Enforcement, Military and PSD contract organizations. Skills are verified by instructional cadre and documented to provide skill verification for student employers. HSS can custom build scenarios into the COMMAND-Pro course by organization request. Health and Safety Sciences, LLC offers two qualifying Confined Space Rescue Technician courses utilizing our mobile confined space rescue simulator. The technical rescue simulator offers both horizontal and vertical entry challenges for would-be rescuers. Our program stresses command and control for uncompromising student safety. Our CSRT Level 1 course is a basic rescuer course that trains students to handle incidents of confined space rescue in low to moderate angles and incidents involving basic tri-pod vertical rescue. HSS’s CSRT Level 2 course is an advance rescuer course that incorporates the elements of CSRT1 and adds 24 additional hours of advance high-angle rope rescue techniques. The additional training prepares students to face technical rescues that can be faced in congested/restricted opening confined spaces, cold boxes, elevated platforms, FGD’s and powerhouse chimneys to name a few. Class size can vary while maintaining an instructor-to-student ratio of at least two (2) instructors for every fifteen (15) students. This provides students maximum opportunity for hands-on experience. We provide all necessary rescue/mechanical equipment for course instruction. Students must be equipped with rescue harness, rope rescue compatible gloves, rescue helmet, safety glasses, knee pads, safety toe boots and appropriate work clothing for the location of the hands-on training.Specialized equipment your organization uses can be incorporated into your training sessions. HSS courses are high speed and performance oriented. It is our goal to keep students in motion from the time they walk into the classroom until the whistle blows at the end of the training day. We cover current technologies and methods as well as time proven techniques. All of our instructors are field experienced firefighters with heavy industrial rescue experience. Skills are verified by our training cadre and documented in compliance with NFPA 1006: Standards for Rescue Technician Professional Qualifications and 29 CFR 1910.146 Permit-Required Confined Spaces. HSS can custom build items into its CSRT programs that include ASHI First Aid/CPR/AED/O2 provider certification, ASHI 48 hour Emergency Medical Responder certification, OSHA 29 CFR 1910.120 (q) Hazardous Material Operation and Technician qualification, Incident Management qualification, and situational awareness modules. These additional modules extend course time to accommodate the additional course modules. American Safety & Health Institute (ASHI) Emergency Medical Response course is designed to provide non-EMS responders including government, corporate, law enforcement, corrections personnel, executive protection professionals and industrial emergency response teams with a level of training comparable to NREMT Emergency Medical Responder. This 48-hour course is consistent with national EMS curriculum requirements and educations standards; however, it is not the intent of the ASHI Emergency Medical Response program to cross the EMS scope of practice threshold. HSS Emergency Medical Response training cadre members are real medical responders that have provided emergency medical care in urban and industrial environments for years. Health and Safety Sciences’ interactive training techniques are designed to immerse students into the world of emergency medical response by utilizing ASHI’s world renowned learning programs. HSS instructors employ comprehensive hands-on instructional methods and train students to stabilize and/or resolve medical scenarios that may occur in their work setting. Each student must not only pass a rigorous final exam, but also must successfully complete a series of skills verification stations before they can earn the distinction of Emergency Medical Responder. This course involves strenuous physical activity under high-pressure demands – HSS builds Emergency Medical Responders one skill set at a time. Health and Safety Sciences’ ASHI Emergency Medical Responder program is fully mobile and can be delivered at any location your organization requests. This program can be provided in conjunction with tactical carbine and pistol courses and earn an additional certificate as a qualified Tactical Medical Professional TacMED-Pro. Talon Group, a division of Health and Safety Sciences, LLC, is pleased to provide private security agencies, hospital security departments, law enforcement agencies, military groups and entertainment planners with a 40-hour comprehensive Executive Protection Professional (EP-PRO) training program. This course covers the full range of the basic principles of executive protection. The training schedule contains both lecture and hands-on exercises. The EP-PRO program culminates in a field exercise that places the agents newly learned skills into practice. The EP-PRO program is conducted over five consecutive days. All Talon Group cadre instructors are certified as executive protection specialist and bring real-world, high-stress experience to the training room. Talon’s instructors come from high-risk contractor, law enforcement, emergency response, and military backgrounds. Clothing appropriate for hand-to-hand defensive tactics training and business clothing (slacks, jacket, tie and appropriate shoes) for the field exercise. Health and Safety Sciences, LLC’s Flammable Liquid and Gas Firefighting Course FLAG-Fighter. Accidental releases of flammable liquids and gases occur across America on a routine basis. These releases offer special hazards to emergency response team members. Should the release find an ignition source and become involved with flame, responders need an expert understanding of the high BTU yield of the ignited fuel and the exposure issue that will result. The FLAG-Fighter 10 hour 29 CFR 1910.156 compliant course is instructed by HSS instructor cadre. Training cadre members are real world industrial responders that have extinguished out of control fires and performed damage control to prevent industrial loss. Health and Safety Sciences’ interactive training techniques are designed to immerse your team members into the world of FLAG firefighting by utilizing its multi-prop FLAG simulator. The simulator operates off of propane and is environmentally friendly. HSS’s instructors employ comprehensive hands-on instructional methods and train your emergency response team members to combat a myriad of FLAG fire scenarios. Each team member dons personal protective equipment and functions under the Incident Management System to perform mission critical firefighting skills. This course involves strenuous physical activity in a high-pressure environment – HSS is proud to boast that we build responders one skill at a time. HazMAT24 is our 24-hour Hazardous Materials Technician Level Course. A chemical release requires a decisive and proactive response to save lives, stabilize the incident and prevent harm to property and the environment. For these dynamic events, your organization needs a fully prepared HazMat unit; meaning certified Hazardous Materials Technician Level trained responders. Health and Safety Sciences’ HazMAT24 training teams are high-speed real world responders that have hundreds of responses under their belts. Our trainers come from fire service, law enforcement, emergency management and military backgrounds. Health and Safety Sciences’ interactive training techniques are designed to immerse your team members into the world of hazmat response. By using comprehensive, hands-on instructional methods, HSS trains your emergency response team members using likely spill scenarios at your facilities. To supplement class lectures, HSS’s HazMAT24 instructors introduce problem-solving case studies to further engage trainees. Each team member dons personal protective equipment and functions under the Incident Management System to perform mission critical skills. This course involves strenuous physical activity in a high-pressure environment – HSS is proud to boast that we build responders one skill at a time. If your organization has special hazards don’t hesitate to ask our training cadre for additional modules. HSS offers modules in Weapons of Mass Destruction, Hazmat and Marine Operations. Workers assigned tasks at hazardous waste sites, storage, treatment, and or disposal facilities are required by OSHA and the EPA to acquire 40-hour HAZWOPER level training before they begin working at these locations. Failure to do so can leave companies vulnerable to citations and fines. In addition to the legal penalties, workers can be exposed to dangerous situations and not even know it. Health and Safety Sciences’ HazMAT40 training group members are high-speed, real-world responders that have hazardous waste site and TSD experience. The training cadre comes from fire service, law enforcement, emergency management and military backgrounds. Health and Safety Sciences’ interactive training techniques are designed to immerse your employees into the world of hazardous waste site operations. By using comprehensive, hands-on instructional methods, HSS trains your employees for likely scenarios at your facility. To supplement class lectures, HSS’s HazMAT40 instructors introduce problem-solving case studies to further engage trainees. Each student dons personal protective equipment and functions under the site safety plan to perform mission critical skills. This course involves strenuous physical activity under high pressure demands – HSS builds safe employees one skill at a time. Health and Safety Sciences, LLC is pleased to offer Public Safety Diving & Water Rescue, Inc. accredited PSD Level 1 certification course to vetted law enforcement, fire service, rescue squads, EMS, government agencies and the military. The PSD Level 1 certification course is designed to provide entry-level public safety divers with the basic skills and knowledge to effectively function on SCUBA diving calls for service. The PSD Level 1 course is instructed by members of HSS’s Talon Group Division. All lead instructors are PSDA & WR certified public safety diving instructors, certified IDEA diving instructors, and IDEA Divemasters. All of Talon Group’s diving instructors are members of elite public safety diving teams and bring years of field experience to the classroom. Talon Group believes in fit-for-duty divers and combines physical fitness, drown proofing, and mental toughness drills to enhance the overall training experience. It is the training cadre’s belief that through rigorous scenarios and low instructor to student ratios mastery level learning can take place in a short period of time. In PSD work, divers do not have second chances and it is important to the training cadre that each student walks away ready to perform in austere water conditions. Students are required to have a full complement of PSD diving gear and two additional air cylinders for use during the course. PSD Level 1 course is 32 hours in length and can be conducted over four consecutive days or two weekends. Should your organization have operational needs for additional training in port security diving, underwater crime scenes, police diving or reconnaissance swimming, please feel free to ask for additional details. Custom training modules can be added to the base PSD Level 1 program to enhance team member training and overall team ability. Students learn how to recognize a life-threatening emergency, how to provide basic life support and what to do in case of an airway obstruction or choking. ASHI’s CPR Pro for the Professional Rescuer has been approved for training for Emergency Medical Services personnel and is accepted by the National Registry of Emergency Medical Technicians (NREMT). American Safety & Health Institutes’ CPR for the Professional Rescuer program is designed for individuals in the healthcare or professional rescuer field that are required to have professional-level basic life support training. Two Basic Continuing Education Hours will be earned through Health and Safety Institute, the parent company of ASHI, an organization accredited by the Continuing Education Coordinating Board for Emergency Medical Services (CECBEMS). ASHI’s Emergency Medical Response program is designed to provide non-EMS responders, including government, corporate, law enforcement, and corrections personnel, with a level of training comparable to a professional Emergency Medical Responder. This 48-hour course is consistent with national EMS curriculum requirements and educations standards, however, it is not the intent of ASHI’s Emergency Medical Response Program to cross the EMS scope of practice threshold. This course is intended for individuals who are not EMS or healthcare providers but desire certification in Emergency Medical Response. Rescue 3 International was founded in 1979 after a California search and rescue team nearly lost one of its own during a water rescue. Nearly 30 years later their mission remains the same: to provide flood, water, and rope rescue training to individuals and organizations with an emphasis on training rescuers to avoid becoming victims. As a result, Rescue 3 has become the recognized leader in water and flood rescue, training over 150,000 students throughout the US and 32 foreign countries. One thing that sets Rescue 3 International apart is their dedication to providing students with practical, real world experience. To this end, all of Rescue 3’s instructors are professionals working in the disciplines they teach. Their instructors include paramedics, firefighters, law enforcement officers, and search and rescue team members, as well as river guides and military personnel. While Rescue 3’s instructors come from a wide variety of fields, they all share a passion for saving lives and teaching others to do the same. The Rescue 3 curriculum was developed by leaders in the field of technical rescue and is constantly updated and fine-turned by a cadre of over 700 instructors in 32 different countries, refining out approach until to ensure it is the absolute best in business. The courses have been independently audited and are compliant with the NFPA 1670 standard for technical rescue in high risk environments including swiftwater, ice and rope rescue. Court cases have shown time and time again that training isn’t worth much if you can’t prove you did it, so we provide extensive documentation of each student’s training. Each student is assigned a certification number and skill sheet (training record) that is entered into a database maintained by Rescue 3 International. The training record can be accessed at any time with just a phone call or e-mail, quoting the individual certification number or person’s name. so that they can access their record at any time in the future, for employment or legal reasons. The skill sheet lists the specific skills and knowledge taught, the relevant NFPA standard, and whether the student performed or observed each skill. This high-level of record keeping is one of the many ways our approach is unmatched by other training companies. Health and Safety Sciences, LLC has a reputation as the best of the best when it comes to emergency response teams and team training. Being recognized by the training cadre of HSS is one of the highest compliments that can be paid to an emergency response team or team member. HSS is proud to offer emergency response teams the opportunity to be recognized among the top of the industrial emergency response profession through our Special Operations Rescue Technician S.O.R.T. program. Upon completion of the industry designated specific course requirements, students are issued a certificate of achievement.